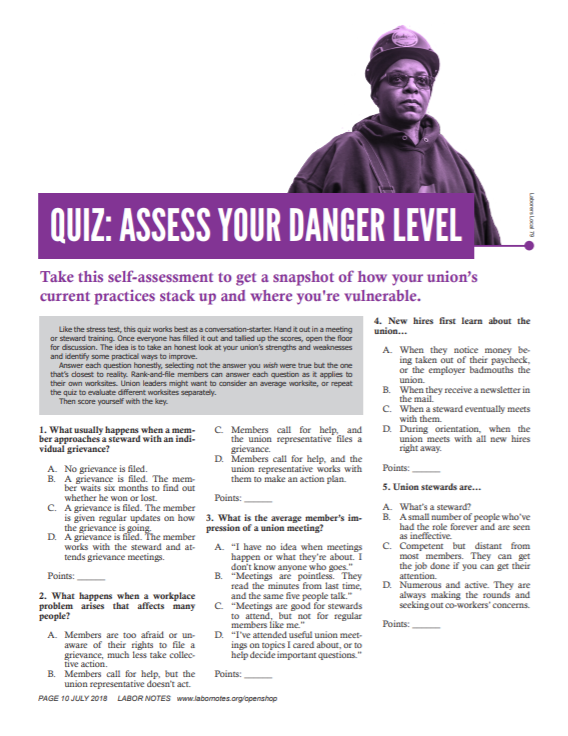 Take this self-assessment to get a snapshot of how your union’s current practices stack up and where you're vulnerable. Like the stress test, this quiz works best as a conversation-starter. Hand it out in a meeting or steward training. Once everyone has filled it out and tallied up the scores, open the floor for discussion. The idea is to take an honest look at your union’s strengths and weaknesses and identify some practical ways to improve. Answer each question honestly, selecting not the answer you wish were true but the one that’s closest to reality. Rank-and-file members can answer each question as it applies to their own worksites. Union leaders might want to consider an average worksite, or repeat the quiz to evaluate different worksites separately. Then score yourself with the key. Click here to download a printable version of this quiz. 1. What usually happens when a member approaches a steward with an individual grievance? A. No grievance is filed. B. A grievance is filed. The member waits six months to find out whether he won or lost. C. A grievance is filed. The member is given regular updates on how the grievance is going. D. A grievance is filed. The member works with the steward and attends grievance meetings. 2. What happens when a workplace problem arises that affects many people? A. Members are too afraid or unaware of their rights to file a grievance, much less take collective action. B. Members call for help, but the union representative doesn’t act. C. Members call for help, and the union representative files a grievance. D. Members call for help, and the union representative works with them to make an action plan. 3. What is the average member’s impression of a union meeting? A. When they notice money being taken out of their paycheck, or the employer badmouths the union. B. When they receive a newsletter in the mail. C. When a steward eventually meets with them. D. During orientation, when the union meets with all new hires right away. B. A small number of people who’ve had the role forever and are seen as ineffective. C. Competent but distant from most members. They can get the job done if you can get their attention. D. Numerous and active. They are always making the rounds and seeking out co-workers’ concerns. A. Proposals and progress are kept secret. B. We get regular updates on progress, but we play no role. C. A few members participate in some contract activities, such as an issue survey. D. Members help make the strategy and many participate in a series of actions building to a peak, such as a strike deadline. 7. After the union’s most recent contract was settled, how did the average member feel about it? 8. If a new steward called the union office for a member list, what would be the response? 9. A member tells a steward that she wants to get more involved. What’s the most likely response? A. She is ignored or told that there’s nothing going on. B. She is told to come to the next union meeting in three months. C. She is invited to a union social event next Thursday. D. She is asked to do something important, like hand out a bargaining survey. 10. 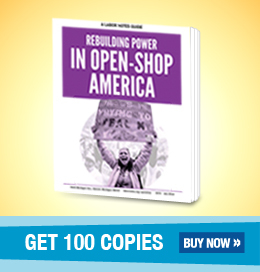 What is the most common pitch union activists make about why everyone should be a union member? A. There is no pitch. You’re at risk for a big drop in membership. If your union is going to survive, it’s urgent to clean house. Look back at each question where you marked A or B; those are immediate areas to improve your union’s practices. (D is the goal.) Which one can you start with? Take heart—you’re not starting from scratch, but you do have room for improvement. If you marked any As or Bs, those are danger areas to focus on first. If not, look at the Cs. For each one you can turn into a D, you will fortify your union against a possible employer attack. You’re doing well! Still, management never lets up—organizing is an ongoing project. Keep lifting up a vision that inspires members to fight. Anywhere you marked an answer other than D, that’s an area where your union could improve.